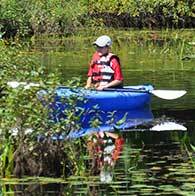 Join us for a morning of fun as we canoe and kayak the Crooked River. We start on the shores of Papoose Pond for this 2 hour adventure. Once we get some preliminary instructions, we head out on our trip. We canoe the length of the pond and venture out into the Crooked River. As we maneuver through the reeds filled with the songs of many birds, we may see a Great Blue Heron fishing for his breakfast. We also discover quickly why it is called the Crooked River. Though it is a winding course, the water flows very slowly, which allows us to enjoy the sights and sounds of the Maine woods. As we venture deeper into the wilderness, we keep a watchful eye for a moose, deer, otter, beaver or other animal along the shore. There are evidences of animals along the way as we pass beaver dams, bird nests, mud trails used as slides by otters. This is a great family activity which will provide many laughs, perhaps a chance to get Dad wet with a splash of the paddle and endless opportunities to take some beautiful photographs in the deep Maine woods. As we end the trip, you will be surprised to discover that the river has curved and twisted around and left you just a quick 5 minute walk from the campground beach. We offer this trip every week, depending on the water level and condition of the river as well as weather. Reservations are needed to ensure a spot; check at the Rental Shed for availability and pricing. All equipment is provided including life jackets and paddles. If you have your own canoe or kayak, we will gladly transport it back to the campground for you for a small fee.